Trevor Story makes wild, amazing throws all the time. Credit: Joe Camporeale, USA TODAY Sports. This Rockies – Diamondbacks series has had a little of everything, and we’re only two games in. 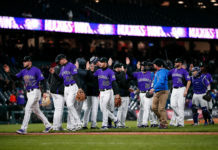 There have been huge home runs — like Ramiel Tapia’s grand slam Friday — an amazing defensive play by Scott Oberg late Saturday, scores on throwing errors and so much more. 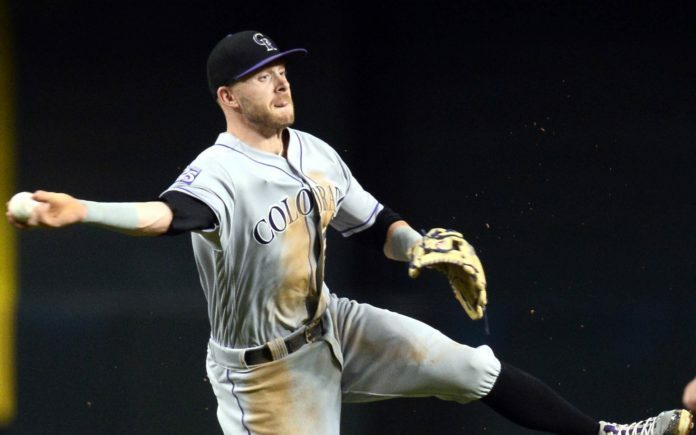 And, one of the best plays of the first two games of the series came during last night’s comeback, 6-5 win by the Rockies over their divisional rival D-Backs, with All-Star Trevor Story roaming way right to throw across his body and make an out. So, to celebrate the incredible play by Story, the official MLB account decided to share this tweet. 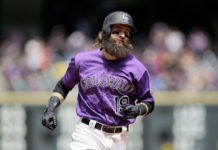 In a way, they gave props to Story, putting on display one of the best players in the game which many baseball fans likely don’t usually get to watch, since he plays in the Mile High City. On the other hand, they compared Story to “No. 2,” which was confusing on multiple aspects. Did they mean Troy Tulowitzki? From a Rockies’ fan standpoint, the backers of the purple and black likely took it that way. And, is that really a compliment? Tulo was one of the four superstars (Larry Walker, Todd Helton, Nolan Arenado) the Rockies have ever had in their 25 years of history, but, the second half of his career in Colorado was a major disappointment. Other fans of baseball thought the MLB was comparing Story not to that No. 2, but to the No. 2 in Derek Jeter. Well, if the MLB twitter account was thinking of this iconic play in the 1998 ALCS by Jeter, they were right on the money. They’re almost identical, incredibly. Of course, the reactions to this tweet and comparing Story to either Tulo or Jeter were hilarious. Some thought it was a disrespect to Jeter, some thought it was disrespectful to Story and others just made their best jokes. Maybe, just maybe, the next time Trevor Story makes an otherworldly play, the MLB account should simply celebrate one of the best, rising, young stars of their game. 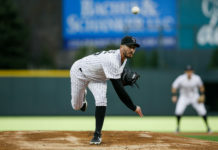 You can watch Story, Arenado and the red-hot Rockies — who have won seven straight games — today in the third game of their series in Arizona with the first pitch scheduled for 2:10 p.m. MST.